We recently told you about some flowering herbs that we like to keep in our home or in our garden. But, later we realized that there were more herbs we wanted to share with you. Herbs are amazing plants because they offer so much beauty, and benefit, for us. They’re ideal for using in cooking, they provide healing in the form of natural medicine, and they lift our spirits when we think about the beautiful way nature provides for us through them. The following are a few more flowering herbs that we think will be great additions to a windowsill, or outdoor, garden. Marsh mallow is a stunning herb that puts out little pink or white flowers for most of the summer. It has velvety, sensual gray-green leaves that look incredible in any garden. Marsh mallow is often used to make healing teas that comfort the body and the spirit. This herb grows to about three to four feet tall, if left undisturbed. Also called Echinacea, purple coneflower is a flowering herb that would be great in a healing garden. 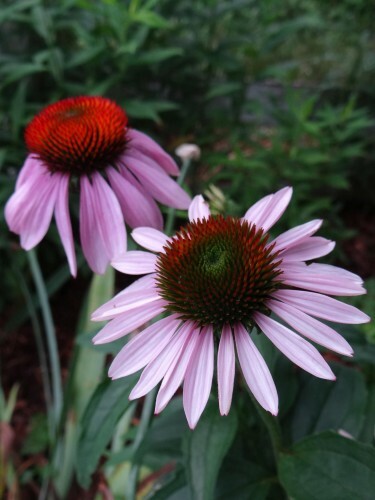 Echinacea is tasty, and effective, when used to make cold and flu-fighting teas and elixirs. It’s signature purple, and pink, petals can help heal the body, and the mind, when it’s under extreme stress. This flowering herb is sometimes known as “queen of the meadow.” It’s a graceful plant that provides creamy white flowers and clusters of leaves from mid to late summer. Meadowsweet grows in clumps, so you can divide it every two to three years to control its spread. Use meadowsweet in calming teas. These, in addition to the other flowering herbs we’ve mentioned, will provide you with a gorgeous garden filled with many benefits for happiness and health. We recently told you about some flowering herbs that we like to keep in our home or in our garden. But, later we realized that there were more herbs we wanted to share with you.Herbs are amazing plants because they offer so much beauty, and benefit, for us. They’re ideal for using in cooking, they provide healing in the form of natural medicine, and they lift our spirits when we think about the beautiful way nature provides for us through them.